Here is another book on preaching to think about this week. Ron Boyd-Macmillan has noticed bad preaching and he thinks it’s OK to be angry about it: God deserves excellence in preaching. His book falls into four main sections, and takes the form of a series of letters to a supposed correspondent. Part two covers what Boyd-MacMillan sees as the six elements of great preaching. He calls these ‘the oral test’; ‘the experience test’; ‘the reality test’; ‘the exegetical test’; ‘the grandeur test’; and ‘the tenderness test’. I will look in more detail at these in a future post. Part three is a bit of a change of tack with a kind of historical-thematic review of preaching through the ages, from the preaching of Old and New Testaments, through Origen and the patristic homily (which he also connects with the Brethren, all the way to the post-liberal narrative form. 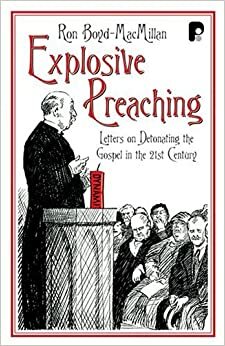 Part four is a grab-bag of items that come under the category of the preacher’s life and which includes material on how to deal with criticism (‘the preacher who cannot deal with criticism will not preach for long’) and how to think of the place of multimedia in sermons. Boyd-MacMillan also shares some of his personal practices, including following a daily liturgy, and wraps the book up with a chapter that includes some examples from the Church in China and a one year course called ‘The 66, the 33 and the 1.’ Preachers had to prepare 66 one hour sermons on each book of the Bible, preach 33 one-hour sermons on the life and work of Christ, and one (timeless) sermon on God’s overall kingdom plan. Overall – a stimulating book, written in a lively style that should serve to challenge and refresh any preacher who doesn’t think they have nothing more to learn! Previous Post Why is spiritual leadership challenging?